While I never made it in the door, my daughter and her friends stopped at Mitchell's last night and she enthusiastically told me it was as good as ever. She did bring me two scoops of my beloved chocolate chip ice cream with the dregs of her hot fudge drizzled over the top, but it came in a plastic cup, which I was not accustomed to getting from Mitchells. It tasted the same to me. She also said the prices appeared to be lower, which I will have to see for myself! Noticed a new ice cream place opened recently right next to Apart Pizza (on Montrose, just west of Lincoln). I don't remember the full name, but I think it begins with "Sweet Treats." For those in the area, it moved into the space that for a long time had the "Jelato" [sic] awning but was otherwise empty. Their mint chocolate chip and chocomania (reminded me pleasantly of Zanzibar) were much enjoyed. This is the best ice cream I've had in Chicagoland. It's a small, family-owned place in La Grange. They have the most inexpensive prices for ice cream that is also the freshest I've had. They make the ice cream right in the back of the shop. My favorite flavor is the peach with chunks of peaches in it. The Berry flavor is also very good. JamPhil wrote: ...a new ice cream place opened recently right next to Apart Pizza (on Montrose, just west of Lincoln). I don't remember the full name, but I think it begins with "Sweet Treats." It is Sweet Treats and it's quite good: high quality ice cream with unique, well-executed flavors and friendly staff. My first time there, I got a half & half single scoop split between Fudge-Almond-Coconut and Cinnamon Bun (real bits of cinnamon bun!). One of my friends got a scoop of the peanut butter-chocolate which had a surprising yet nice sweet/salty interplay going on. You can tell that this place is only going to get better. When we were in there, we heard the owner in a lively discussion about how so-and-so flavor isn't as good as he'd like it so he's planning on switching it with another flavor. I took this as a good sign of an engaged proprietor working to make his shop the best it can be. Aaaaand, they have a Rice Krispie treat-esque thing in their bakery case where they substitute Fruity Pebbles. Count. me. in. Oh, and FYI, they only accept cash. According to this piece, which appeared at New City Chicago's web site, the ice cream is Sherman's Ice Cream, made in South Haven, MI. I scream, you scream, we all—yeah, you get the picture. Slow your roll, though; this isn't your run-of-the-mill 31 Flavors, nor the ubiquitous posh dessert boutique. Lincoln Square has something unique to scream about: Sweet Treats, the area's rookie snack shop, now features Sherman's ice cream, the family-owned brand from South Haven, Michigan that has quite a following here in Chicago. Made it back to Sweet Treats over the weekend and had one of their ice cream sandwiches. 2 very tasty peanut butter cookies with Chocomania ( rich, dark chocolate)ice cream sandwiched in the middle. $2.50 well spent. Sherman's is one of the few ice creams still in existence from my childhood. Our family had a summer home in Coloma and the short trip to South Haven to Sherman Dairy was a nightly treat. Long gone are the Buffalo on Pulaski & Irving Park, Lockwood Castle on Devon & Caldwell, Peterson's on Touhy in Park Ridge, and the Milk Pail on Devon in Lincolnwood. Long live Sherman's ice cream, now in Chicago at Sweet Treats. We stopped in at Sweet Treats last week, and were pretty impressed. I'm not a fan of ice cream scooped from a tub - generally I prefer custard - and I have always disliked chocolate ice cream. Even so, I had and enjoyed a scoop of peanut butter chocolate. It had a rich chocolate flavor that I rarely find in most ice cream parlors. Oh, and then there's the ice cream I made last night - cinnamon and pine nut. I am sorry to say the pine nut adds nothing but debris to pick out of the teeth when done. Interesting. I tried some Sherman's the other day in MI, assuming it was from the Detroit area or from up north, given the Mackinac fudge flavors. Seemed to have a tremendous amount of butterfat, but that was based only on a tiny taste of my kid's cone. The fudge was very good, BTW. We took the kids to Uncle Harry's Ice Cream in Addison last night. It's tucked in a strip mall a few storefronts down from Food Harbor on Lake St. (and behind Famous Dave's and La Hacienda). It's a nice, open shop with tables set up both inside and outside. Between us, we ordered 5 different flavors, all excellent. I personally had pistachio, which was filled with whole nuts--almost, but not quite, too many for me. My youngest selected their banana cream pie ice cream, which sounded like an abomination to me--until I tried t. Very good--no artifical banana flavor at all. I spoke to the owner for a few minutes and he explained that they make all their product in small batches (I think he said 30 gallons?) at their dairy up in Wisconsin. The banana ice cream, he said, is made with pureed bananas. Peach is made with real peaches. If there are brownie bits mixed in a flavor, they come from the coffee shop he owns next door, where he personally does most of the baking (though I haven't sampled any). He also claims to make a mean key lime pie....again, from scratch. In any case, it was the freshest tasting ice cream I've had, with flavors that actually taste the way they are supposed to. Certainly the best I've had in the Oakbrook/Elmhurst/Addison area. Perhaps those of you in the city can get equally good or better stuff, but I am very happy to have found this place. Not sure if anyone has posted here on the gelati at Pasticceria Natalina. There were four or five great-looking flavors on Thursday when I stopped by. I didn't try any, but given the outstanding quality of everything else in the place, I'd be willing to bet they are great. The ice cream was fresh and creamy. Easy to melt, they have some new holders that catch the drippings. Recently, I took some friends who grew up in Chicago for an adventure. They are all native Chicagoans who are in their 80's. The conversation shifted to ice cream parlors with me lamenting about the Buffalo. One of the women ranked Glick's at Lawrence and Lawndale as a step above The Buffalo. Another mentioned Rudich at Central Park and Lawrence on par with The Buffalo. Both places are long gone and a cursory search here offered no mention. Anyone recollect anything about these ice cream parlors? Gramp’s is just over 5 years old, though it is on its 2nd owner and advertised for sale. We went biking on the Fox River Trail today and our turnaround point was St. Charles, where I was pretty sure there would be ice cream (and had vague memories of Cathy2's mention of Gramp's). We first stopped by the bike store in the same strip mall— the Fox River Trail fully understands the two main shopping needs of the summer biking family— and I asked the bike store owner about Gramp's. He said to order a single scoop, because the new owner serves much bigger scoops than the previous one. So Gramp's is now on, what, 3rd owner in 10 years? 4th? Who knows. But it's certainly good custard; the chocolate was as good as Scooter's, the vanilla a little less so, lacking quite the intensity of real vanilla flavor. Still, a big scoop at a reasonable price, not much more you can ask for on a bike trail. I did a search, and didn't find Evanston's new little ice cream shop, I Dream of Sweets. We stopped in a while back for a couple cones - the owner couldn't be nicer, and the place has been renovated and is bright and cozy. Unfortunately for me, they sell Chocolate Shoppe-style ice cream, (yes, they carry the almond-type Superman flavor) which I find to be sweeter than I like - but I'm going to go back and try pastries! Cool. This is right around the corner from my office. I'll have to stop in on Monday. Thanks for the heads-up. Does anyone remember a brand of ice cream that was sold at Wild Oats called Swiss Gourmet??? ?It was a chicago micro dairy,at least i beleive it was,and it was THE best Mint Chaocolate Chip ice cream. For those of you that vacation in Southern Wisconsin,in Whitewater, try Frostys frozen custard. I stopped by the new Cloud 9 for shaved ice cream today. Shaved ice cream, I believe, has come to us from Taiwan. It looks really cool shaved into the bowl and looks like you are getting a lot, but it's very light. Texture wise, it does remind me very much of snow. I had the strawberry with a blueberry sauce. The ice cream is low fat and low cal and the blueberry sauce had no added sugar, so it's a healthy frozen treat. But alas, it was a mighty flavorless frozen treat. I really couldn't taste much strawberry or blueberry. It mainly tasted like lightly sweetened, slightly creamy snow. It's kind of cool and I'm glad I tried it. And it's a family-owned shop so I'd love to support them, but shaved ice cream will not be replacing my Scooter's fix any time soon. 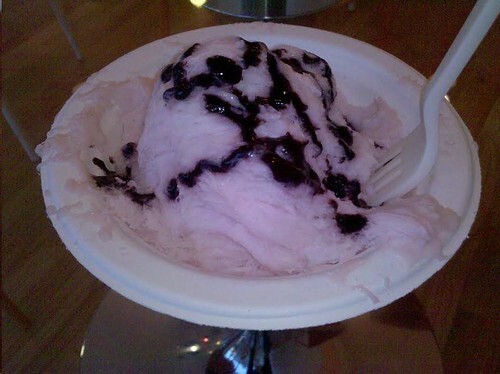 Hellodali wrote: I stopped by the new Cloud 9 for shaved ice cream today. I've visited Cloud 9 twice (separate from Hellodali) and came away unimpressed. I agree that it's certainly a novelty dessert in Chicago, worth experiencing once, but it did nothing to satisfy my cravings for a cold, summer treat. I think this was a friend's description, but on sight, the shaved ice looks a little like very thin chocolate shavings. It's more icy than milky, not much flavor, especially the vanilla. Mango was a little better. I might be lured to return for one more try if they mixed up the flavors more--one of the owners told me that they have considered adding such snow ice varieties as red bean and green tea, but they were unsure as to how those flavors would sell. I thought the syrups and dry toppings too conventional as well. It'll be interesting to see how Cloud 9 fares with the plethora of frozen yogurt and ice cream shops in Lakeview. happy_stomach wrote: the shaved ice looks a little like very thin chocolate shavings. It's more icy than milky, not much flavor, especially the vanilla. Is this shave ice like you would get in Hawaii? I don't think it's like shave ice. I looked up some pictures of that and what I got at Cloud 9 looks quite different. Here is a not so great cell phone pic of my strawberry with blueberry sauce. And yes, they do give you a fork with which to eat it. Nope. It's different. This stuff seems to be pre-made with te flavor already in it. Shave ice is more like a sno cone with beans in the bottom of the cup and flavors poured on top. I went to I Dream Of Sweets in Dempster St in Evanston the other day and I found this place to be the most charming place ever! The Ice Cream was delicious, they serve Hersheys Ice cream,and the pastries it's wonderful too! I suggest it to everyone.The owner and the staff are friendly and courteous. LANSING | Gayety's Chocolates and Ice Cream Co.'s has been proclaimed one of the nation's top 50 and Illinois' best ice cream parlor by USA Today. Gayety's Chocolates and Ice Cream Co. Inc.
Just tried a new flavor of the "maeda-en" brand of Asia-inspired ice cream... their Lychee flavor made us moan with every bite... but the other two favorites are green tea and red bean... yes... bean! ...oh so delicious. Looked them up on the net and found out they also have mochi bon bons and other flavors include mango and ginger. First found the Green Tea at H-mart and just discovered the Lychee at one of our first visits to Fresh Farms in Niles. mmmmmm... If you're looking for an unusual and delightful flavor, give this ice cream a try.